In the last 6 weeks, we’ve taken about 6 trips with Shiloh – some road trips, some on planes. 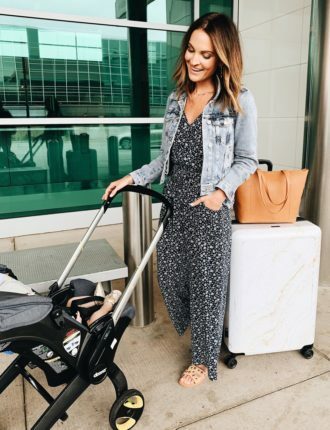 I’ve gotten so many requests from you guys to share some tips for traveling with a baby, so that’s what today’s post is all about! Before I share my tips though, please know, I am not an expert in this area by any means! And, just like every other baby post I share, remember that every baby is so different. And every baby STAGE is so different. So, what works for us might not work for you [Shiloh is currently a little over 3 months old btw]. But I’ll try to just share a few generic tips today that I think could be helpful for anyone! 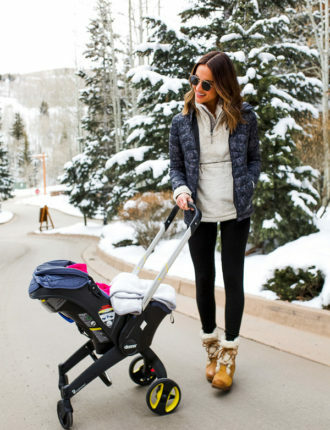 First, let’s talk about packing for your baby. The first (3 day) trip we took with Shiloh, I could not BELIEVE how much stuff we packed for such a short trip and such a tiny human haha. But, when you’re packing for your baby…you need to bring everything with you that is a part of her bedtime / sleep routine. You want to recreate her sleep environment wherever you are. So for us, we pack her sound machine, swaddle, and the nanit monitor [if we’re not going to be in the same room as her]. Other than sleep essentials, packing for baby is pretty simple so I won’t go into more detail there. Clothes, diapers, wipes, her bath stuff if you plan on bathing her on your trip, pacis, spit up rags, etc. Next, I’ll talk about flying with a baby! So we have the doona stroller which you see pictured above and I am OBSESSED with it, especially for traveling. This stroller is clutch in the airport because you don’t have to worry about carrying your baby or getting your wrap all set up. We walk into the airport, check our bags, and stroll right onto security with the stroller. When you get to security, collapse the stroller down into a carseat and put it on the belt to go through security. Carry your baby through the scanner when you walk through. Then, the carseat comes out, pop it back up into the stroller, and continue on to your gate! Here is the question I’ve gotten a million times: do you bring the doona onto the plane or gate check it? Do you buy a seat for Shiloh? We usually fly Southwest, and everytime we do, we ask the gate agent if the flight is full. MOST of the time, the flight has not been full. In that case, we bring the doona onto the plane with us, and put it in a window seat for Shiloh to sit in during the flight! It’s SO convenient and nice that we don’t have to hold her the entire flight. If the gate agent tells us the flight is full, then yes, we gate check the stroller, and hold Shiloh for the flight. But, no we do not buy her her own seat! 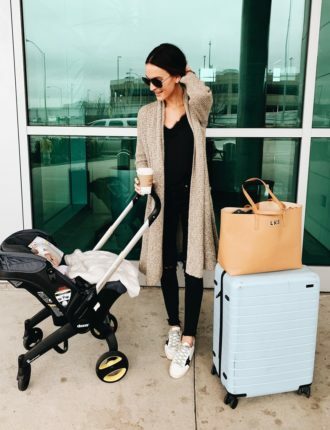 [Make sure you tell the gate agent that your stroller collapses down into a carseat and is airline approved so they don’t try and make you gate check it if you don’t have to]. If you have a very long flight and don’t want to have to hold your baby the entire time [assuming flight is full], might be a good idea to bring a boppy to put on your lap! Now onto the actual flying part. Everyone told me to make sure I nursed Shiloh on take off and on landing so that her ears don’t pop. Honestly, I haven’t done that on any of our flights and she hasn’t cried one time! She’s always been asleep during takeoff and landing so I didn’t want to wake her up. I made sure she had a paci in her mouth / hoping the sucking on the paci would help with that. But, that’s the #1 tip I got from people about flying with a baby. So I wanted to pass that along to you guys even though we didn’t necessarily do that! Feeding on the plane. When we flew, for the most part I just stuck to Shiloh’s normal schedule. She eats about every 3hrs, stays awake for a bit, naps, then we do it all over again haha. So on our flights I would usually let her nap until she woke up, nursed her, played with her, until she fell asleep again. I’ve heard a lot of moms say though that your baby will want to eat constantly when you’re traveling. So, I guess be prepared for that and be okay with feeding more often than you typically do! We didn’t experience that though! If you need to change baby’s diaper on the airplane…there is a tiny changing table in the airplane bathroom. It’s not ideal but it’s not terrible! Just make sure to wipe everything down first with a sanitizing wipe! I always bring frozen breastmilk with me in my carry on bag. Typically when we’ve traveled we’ve had weddings or something at night and had to get a babysitter [aka her grandmother] for Shiloh…meaning she would need to take a bottle [she is exclusively breastfed right now]. I put my frozen breastmilk in this freezable lunchbox with icepacks and it stays frozen for HOURS, until we reach our destination and I can put it in a freezer. Usually TSA will pull / inspect my bag, but there isn’t any issue bringing breastmilk through security! Just be prepared for them to pull your bag. In Shiloh’s diaper bag on the plane, I always make sure to have a change of clothes for her, just in case she has a blowout or spits up everywhere on the plane. Moms also recommended that I bring a change of clothes for myself too but I haven’t gone that far yet haha. But, it’s definitely the smart thing to do if you want to be super prepared! In her diaper bag, I also bring pacis, spit up rags, toys to entertain her while she’s awake [honestly at this point we rarely use those], and the baby shusher in case of emergency haha. On the plane though, the only thing we’ve ever needed has been a paci [thus far], and then my nursing cover so I can feed her on the plane! Oh, and sanitizing wipes FOR SURE! Airports / planes are covered in germs! We typically book early flights bc I’ve found that works best with Shiloh’s schedule. A lot of times we will leave around 5 or 6am which is before Shiloh usually wakes up. So, right before we need to leave, I get her out of her crib, change her diaper, put her in the carseat, and we go to the airport [I leave her in her pajamas!]. That morning, I also pump right when I wake up and put that milk in a bottle, so if she doesn’t go back to sleep once I put her in the carseat…I feed her that bottle on the way to the airport [while she’s in her carseat, and Michael is driving]. But, the ideal situation is she sleeps until we get to the airport and through security and I feed her after that! The goal is to keep baby as close to their normal routine as possible. So if Shiloh’s first feed of the day is usually at 730am, I try to find a flight that will allow us to stick with that! I got lots of questions about feeding Shiloh on the go or on the plane. So I’ll be honest…I don’t love breastfeeding in public and I’m not super comfortable with it. I always make sure to bring my nursing cover and wear something that’s easy to breastfeed in [like a button down top]. A lot of airports actually have nursing pods or rooms you can go in to breastfeed your baby in private which is SO nice! If not though, then I’ll just feed her at our gate if I have to with my cover on! And nursing her on the plane is pretty easy because you’re kind of secluded in your own little seat anyway. But, I get it! I don’t like to breastfeed in public and I know it’s not easy. Just remind yourself that baby getting fed is the priority, and you will never see these airport people again haha. Just do you momma! A lot of people also asked me about nursing vs giving a bottle while traveling. I don’t prefer to breastfeed in public but I’ve found it’s a lot easier than giving Shiloh a bottle and having to worry about pumping. No thank you! Now I’ll share a few tips for actually being on the trip with a baby. First, let’s talk about schedule. I’ve shared before that I was [am] pretty OCD about Shiloh sticking with her schedule and it stresses me out when she gets off of it. For the most part, I do my best to keep with the schedule when we travel. It makes me feel better, makes her sleep better, and everyone is happier all around haha. There have definitely been a few days though where things just got SO off and the schedule went out the window. When that happens, just take a deep breath and remind yourself “my baby is safe. she is healthy. she is okay. we’re all okay.” Don’t let it stress you out. You will get back on your schedule the next day, or maybe when you get home! 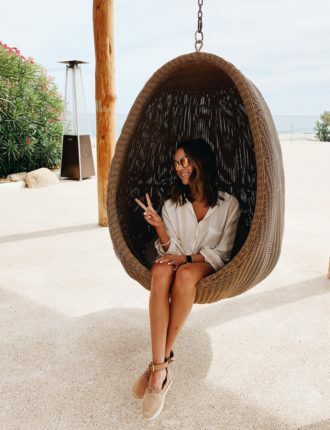 But honestly my advice is if you are on a schedule / in a routine at home, do your best to stick with that schedule on your trip [but don’t let that stress you out]! Maybe you won’t have every single nap in the crib but you can do your best to keep things as normal and routine as possible! This was actually a lot easier than I thought it would be! While we’re on the trip…if Michael and I ever want to go out after “bedtime”…I will put Shiloh in her pj’s, feed her at her normal time [around 7:15pm], put her in the stroller and just take her with us! This is where I’m sure every baby is totally different but 9 times out of 10, she just sleeps in the stroller while we’re at dinner! Then when we get back to the hotel, I change her diaper, top her off with a little milk, then put her to bed. It’s worked like a charm for us! 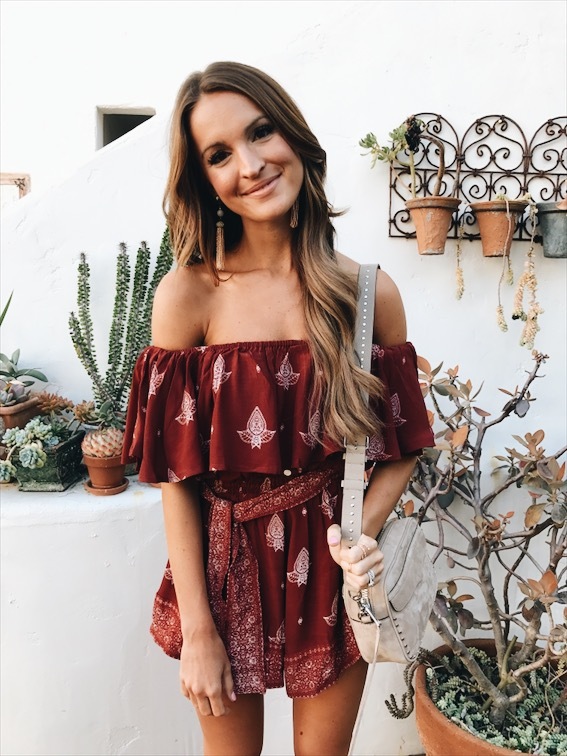 If you are traveling to a different time zone…I personally try to keep Shiloh in her own time zone [so for us, mountain standard time], if the trip is short [like 3ish days]. If the trip is longer than 3 days…keep the baby on their time zone on that first travel day, and then slowly transition into the new time zone the next day. [This applies if there is like an hour or two difference…if you’re traveling overseas, I have absolutely no clue how to do that haha]. I think you’ll be surprised that your baby will kind of readjust and adapt to the new time zone! [At least that was our experience with Shiloh]. A lot of people asked me what Shiloh sleeps in when we travel. Before we take the trip, we call the hotel ahead of time and ask if they have a pack & play or a crib that could be brought up to our room. Thus far, every hotel has said yes! So, Shiloh sleeps in that and her swaddle of course when we travel. At home, Shiloh does not sleep in the same room as us…so when we travel, we put her in another room if possible. Otherwise – she doesn’t sleep as well and neither do we! If your hotel has a separate living area, put the crib in there. If it doesn’t, we’ve put Shiloh’s crib in the bathroom before haha and it works just fine! As long as she has her swaddle and sound machine, she’s good! [If your baby usually sleeps in the same room as you, you can obviously still do that when you travel! Whatever you do at home, try to recreate that exact same environment when you travel]. If we are road tripping, we also bring Shiloh’s bouncy seat with us so she has something to hang out in in the hotel when she isn’t asleep. If we’re flying, we don’t bring any kind of seat with us. We use the doona as her “bouncy seat” [what she can lounge in in the hotel room] if we need to on the trip! I also got some questions about naptime while traveling. When we’re home I try to do as many naps in the crib per day as possible. That’s not really an option when we’re traveling…but if possible, I try to still get at least one good nap a day in the crib. Beyond that, I ALWAYS bring my solly wrap with me and wear her for a lot of naps, bc she sleeps so well in that thing! Just know when you’re traveling…you might not get 2 hour naps everytime, and some naps will be in your arms, and thats perfectly fine! Honestly, I was terrified the very first time we flew with Shiloh. What if she screams on the plane? What if we get totally off the schedule? What if she gets sick? SO MANY what ifs. And honestly, traveling with her was 100x easier than I was expecting! If you have a newborn or a baby around Shiloh’s age, this is actually the easiest time to travel with them IMO and from what I’ve been told. Shiloh has surprised me every single trip – does fine on the plane, adapts to a new environment / routine, sleeps fine at night…I know this might not be true for every trip we go on or for every baby. But I say that just to encourage you – your baby might surprise you and adapt way better than you think! What’s important is that he or she is fed and loved and taken care of. And you know how to do those things regardless of what location you’re in! Don’t get me wrong – traveling with a baby is a lot of work and completely different than when Michael and I used to do trips just the two of us. But, don’t let a fear of traveling with them or all of the “what ifs” hold you back from adventures! The more you do it, the easier it’ll get and the more comfortable you will become! If you have any other tips for traveling with a baby, or any questions I can answer, leave a comment below! These are such great tips! I’ve been traveling with my kids for years and I completely agree with all of them. And a big YES to a paci if not feeding during takeoff/landing. Shilloh is so blessed to get to travel with her parents! !